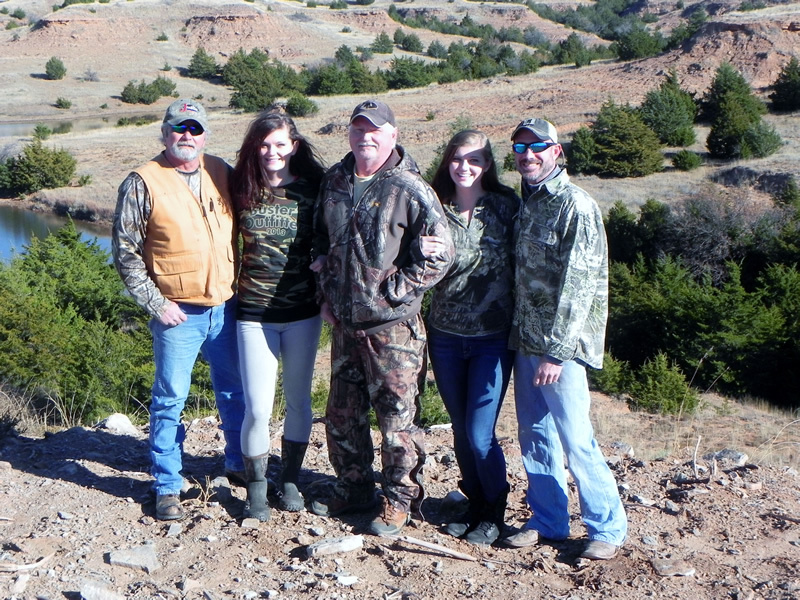 Southern Kansas Deer Hunting on over 30,000 private acres in unit 16, in beautiful Barber County. 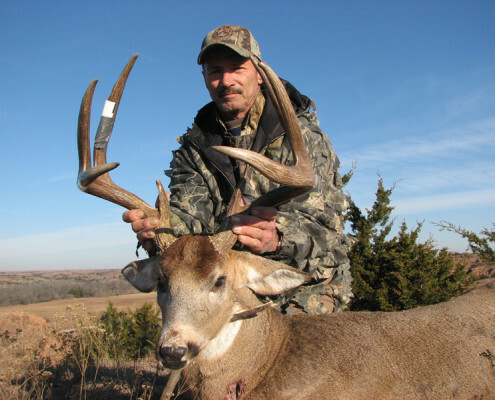 Buster’s Outfitters provides Kansas Whitetail Hunts for muzzleloader, rifle and archery seasons, as well as full accommodations during your stay that including lodging, meals and guide service. 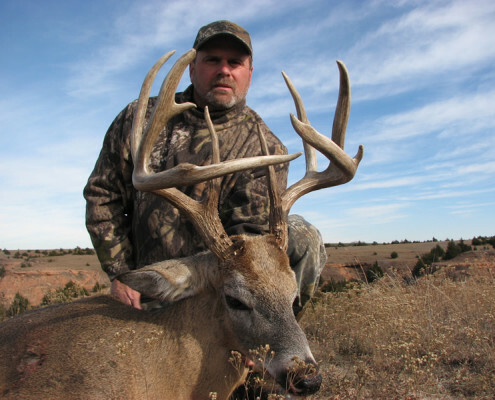 Buster’s has exclusive hunting rights on some of the very best private land in Kansas’s unit 16 and surrounding counties. 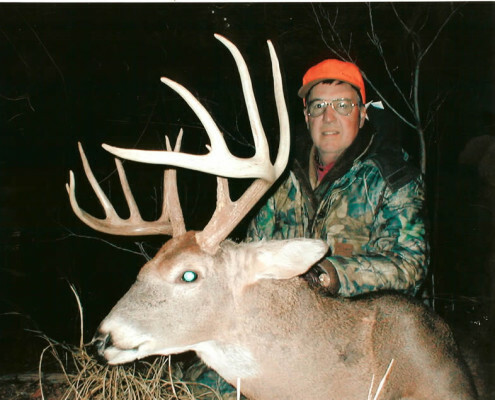 We pride ourselves in the ability to provide a great opportunity for a 150+ class whitetail deer and also the chance for an opportunity of lifetime as 200 class whitetail deer are taken each year in our area! 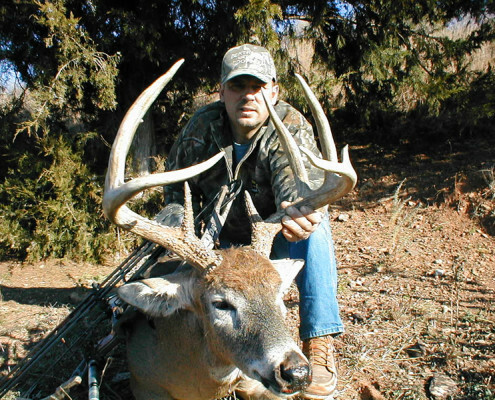 Buster’s Outfitters has some of the best Guides and spotters in Kansas which is why over the past 17 years our success rate has been a staggering 90%. 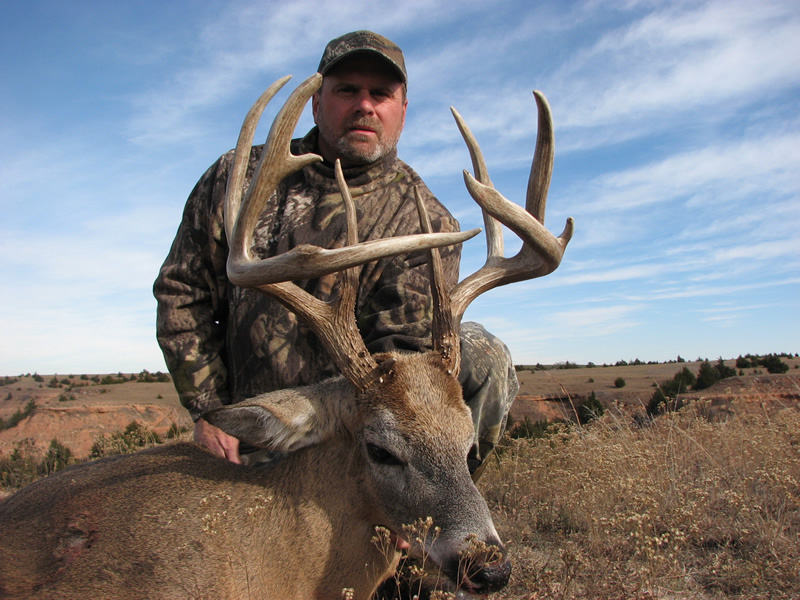 The Kansas muzzleloader season is the last two weeks of September which is a six day hunt. 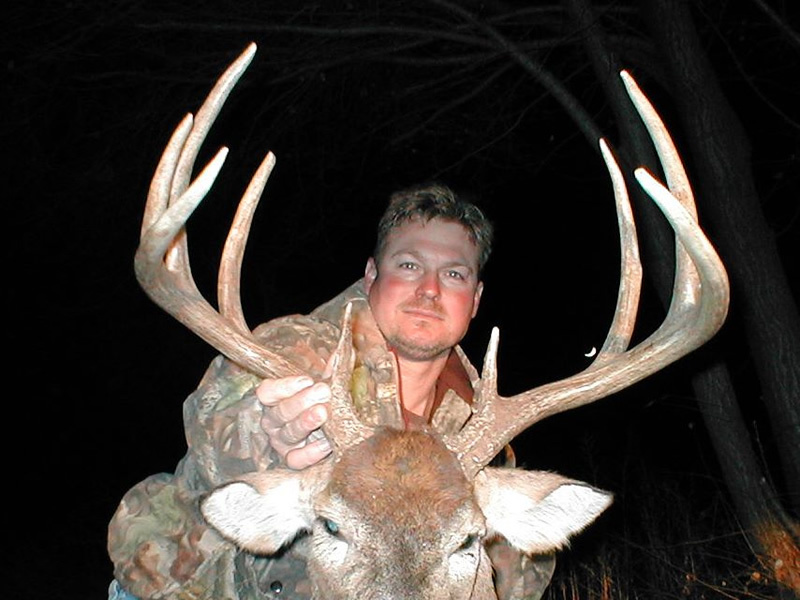 We will be hunting more around the irrigated farm ground on soybean and corn fields. This is where the biggest bucks are still feeding and moving. This is a very good time of the year as you will be the first to hunt the new deer. 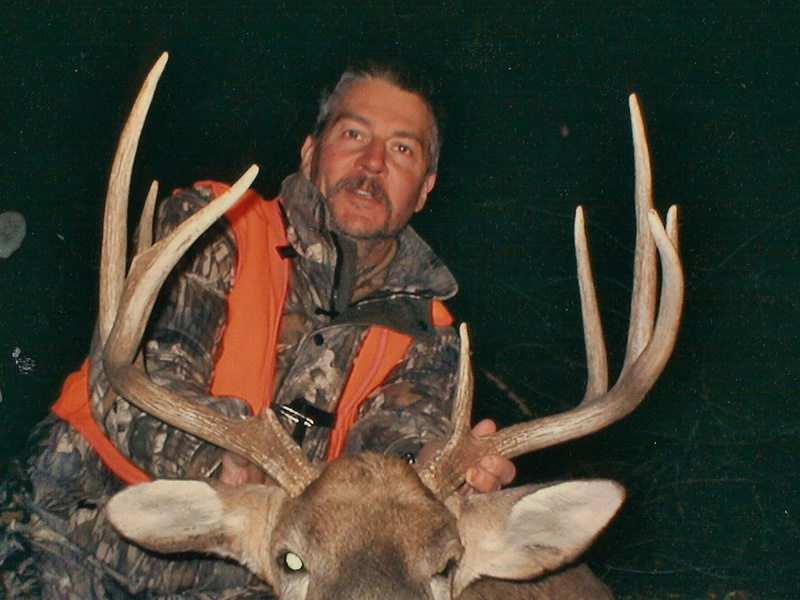 Our guides will have pre patterned our trophy whitetail deer hang outs and be able to put you on the stands that are seeing the most activity and largest deer for your best opportunity for that early season buck. 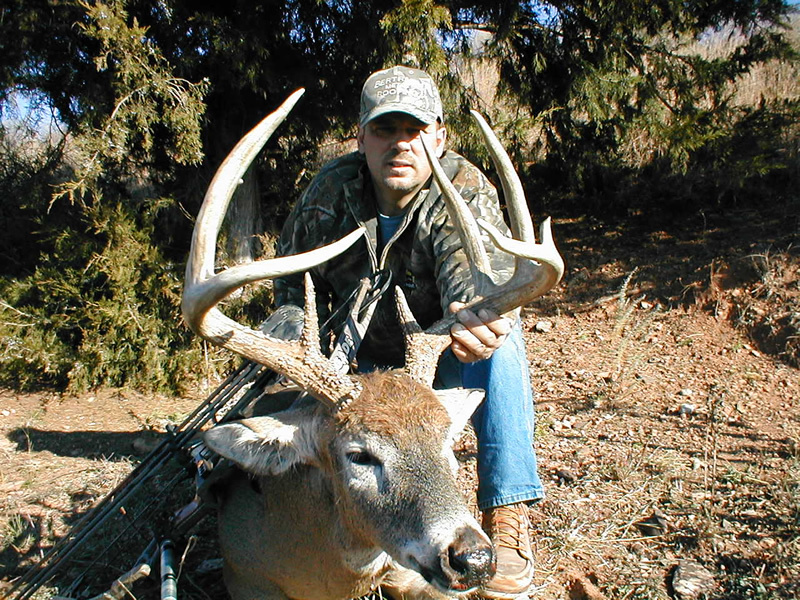 Our Kansas Whitetail Archery Hunts are the last week of October and the entire month of November. 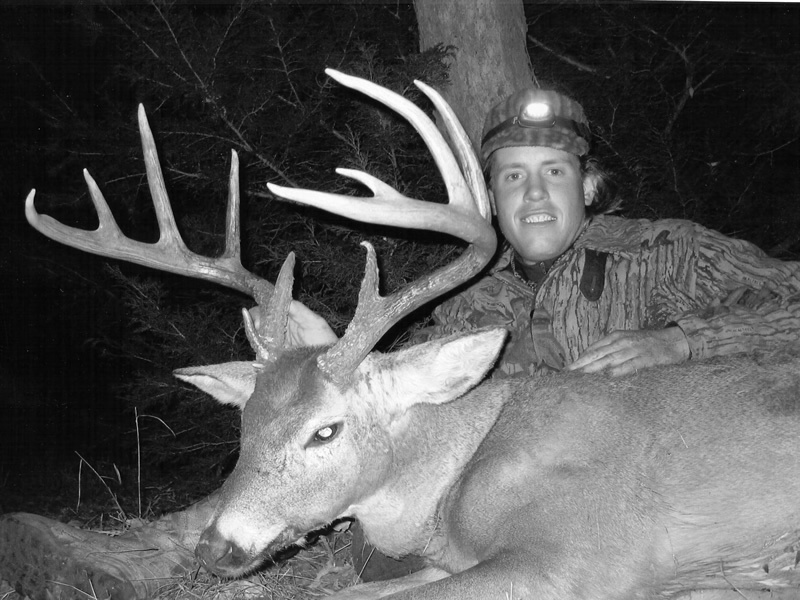 This is the time to be in the woods for a trophy of a lifetime opportunity. 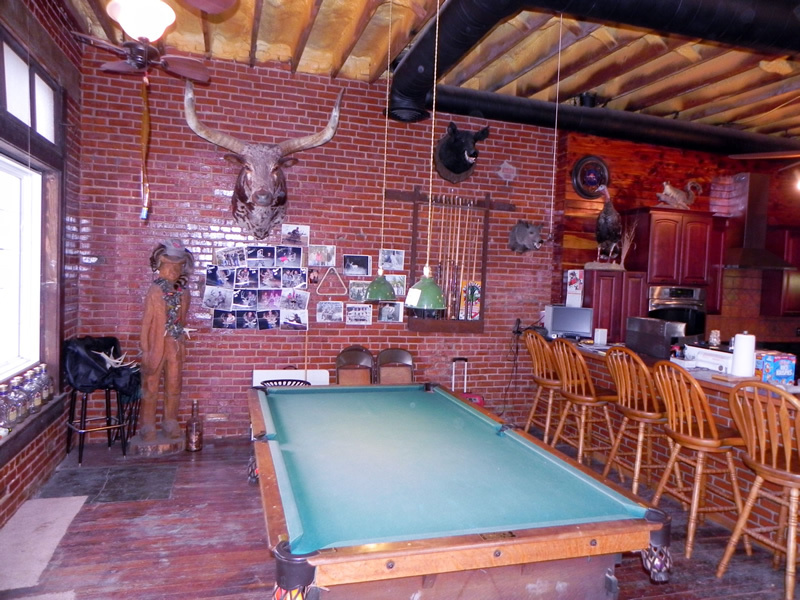 This is what barber county Kansas is famous for. 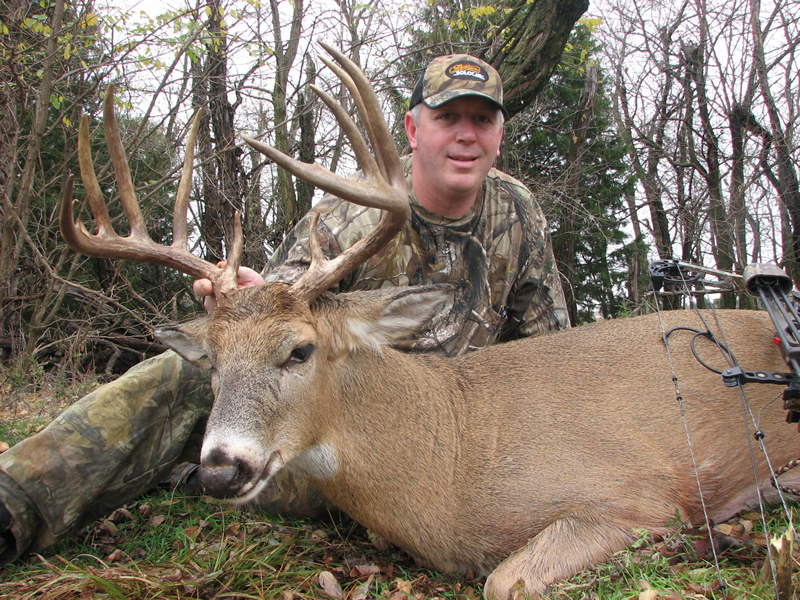 During the rut you will not believe how many really good bucks that can come out of the woodwork on any given day in November. 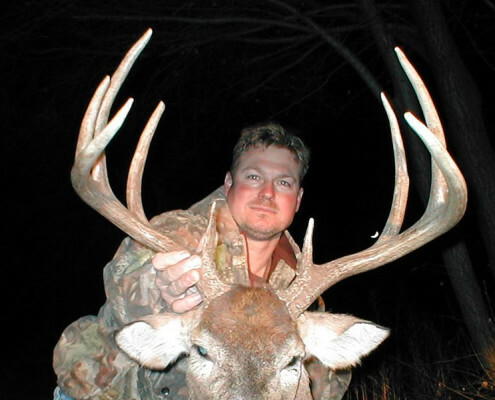 Stay on your toes and be ready as the patient whitetail deer hunter will see and have the chance to harvest a great 150+ class deer. For our Rifle whitetail deer Hunts we will be hunting out of ladder stands, ground blinds and towers stands. 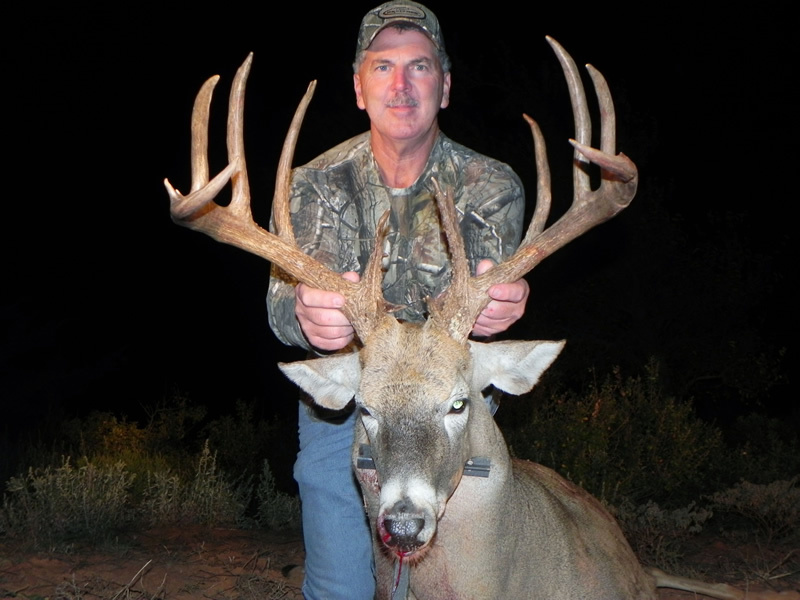 One of the reasons for Buster’s high success rate is because we have about 50 ladder stands and 40 bait stations – locations all positioned over farm fields, food plots, or food stations. 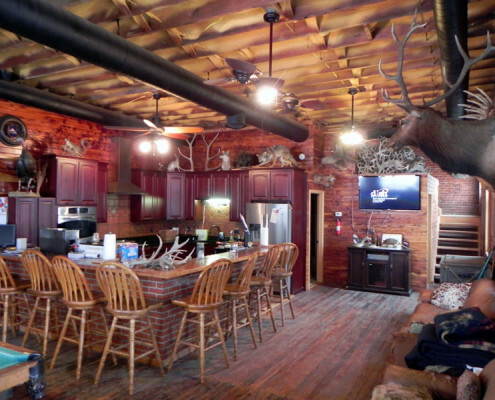 The ground blinds and towers stands will be heated if the temperatures fall to uncomfortable levels. 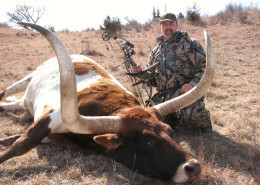 You ask and we can provide as we want to make you Kansas Whitetail Deer Hunting Trip as comfortable as possible. 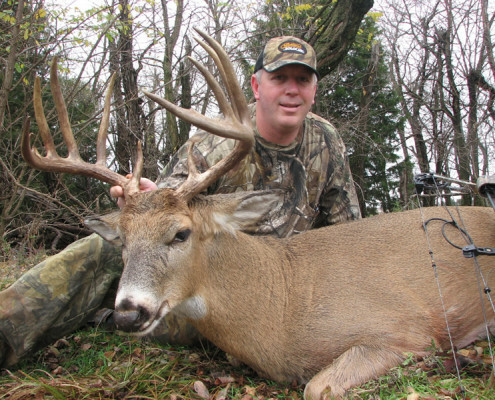 The Kansas whitetail hunts with rifle are generally the first 12 days in December. 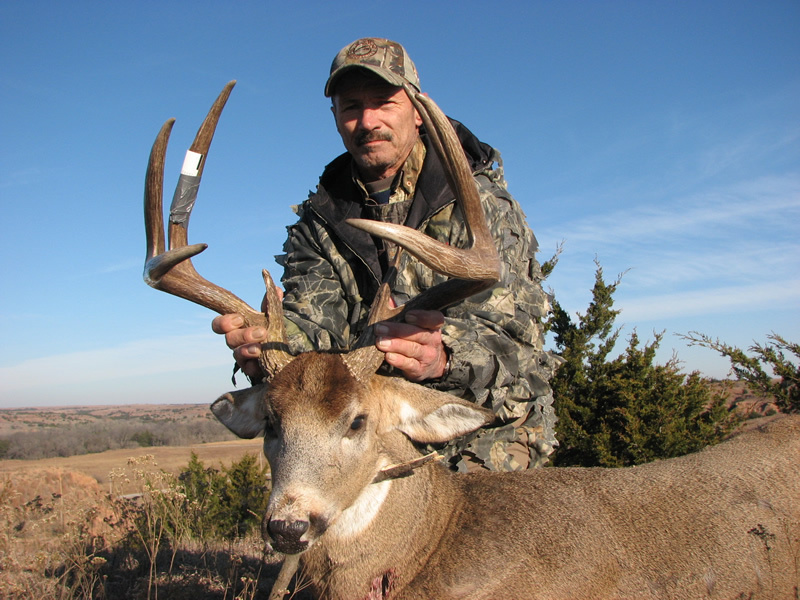 We hope you can come join us for a truly memorably hunting experience one that gives you all that Kansas Deer Hunting has to offer. 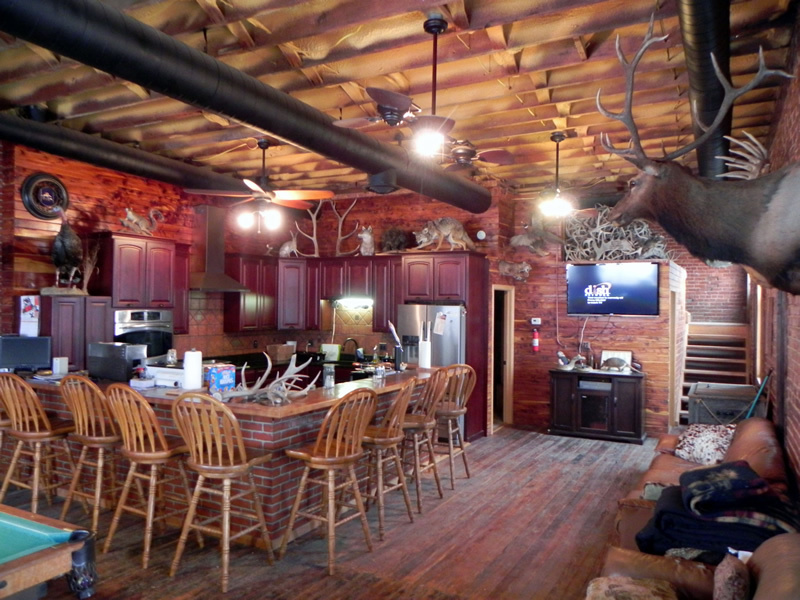 All the whitetail deer hunts include lodging, meals, guides, skinning and quartering of your harvested game. 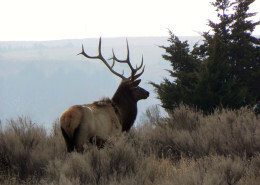 Caping available for a small additional fee. 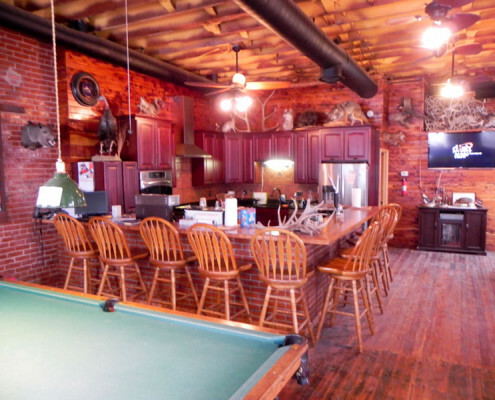 The meals are all home cooked and prepared to your liking. 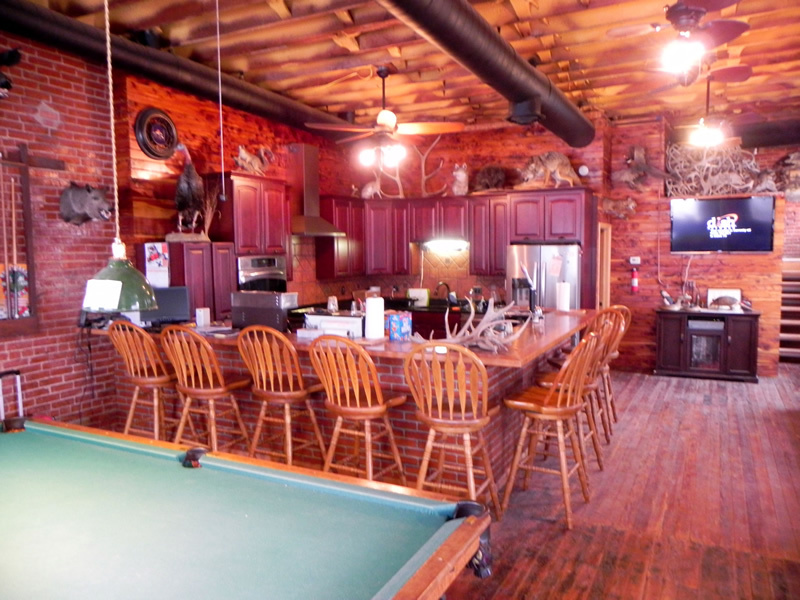 We also can accommodate any dietary needs that you might request, just be sure to let us know during booking your Kansas Whitetail Deer Hunting Trip if you or anyone else in your hunting party has special needs. 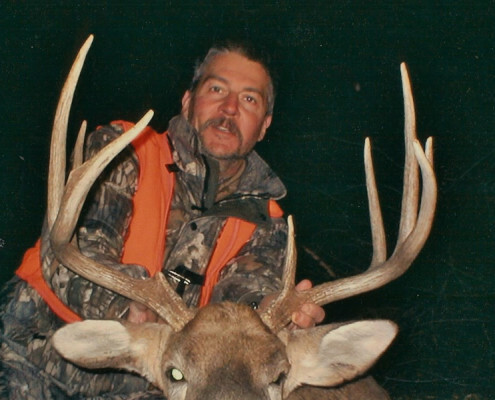 See all of our deer hunting pictures! 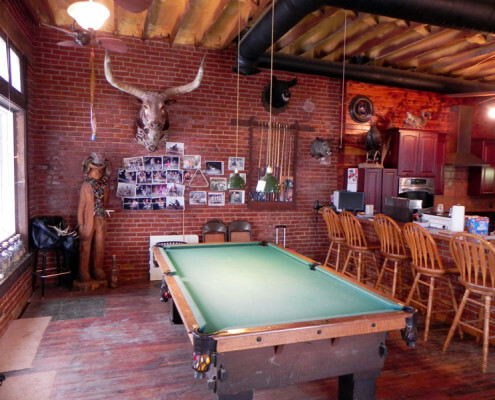 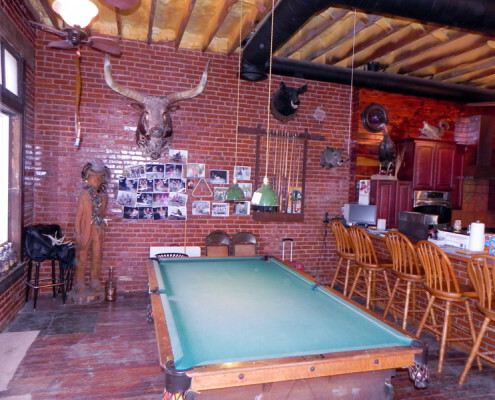 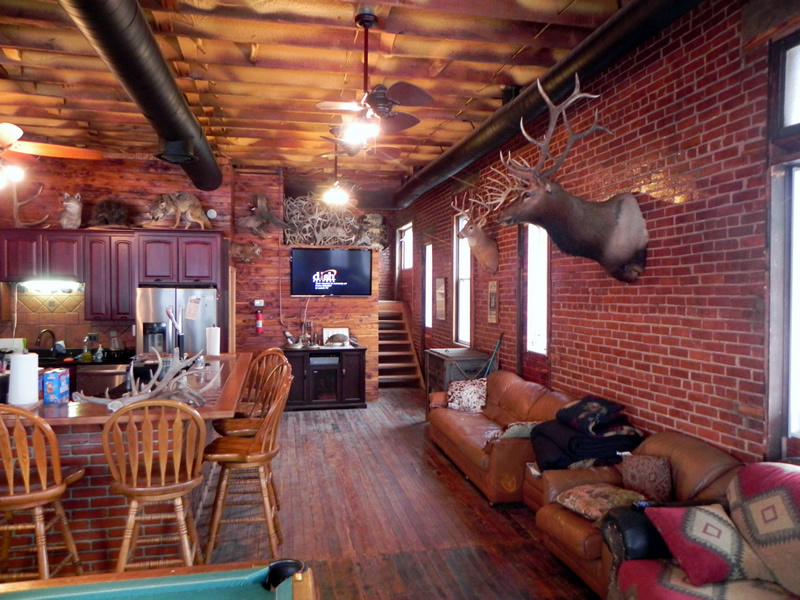 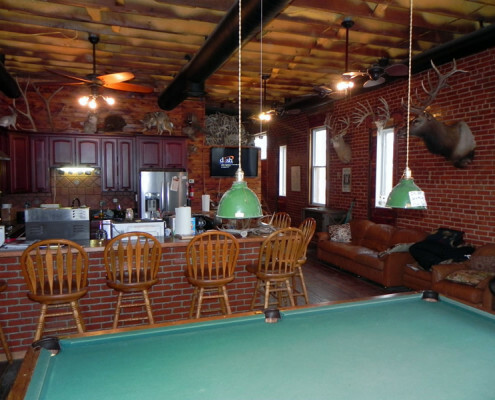 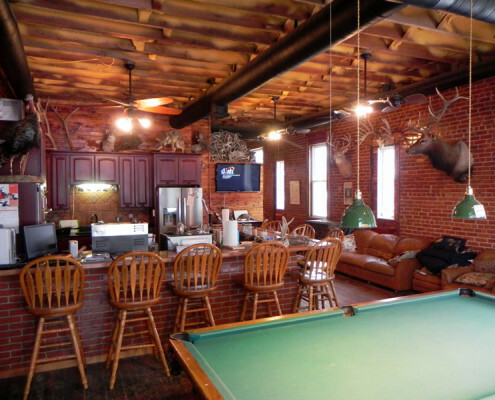 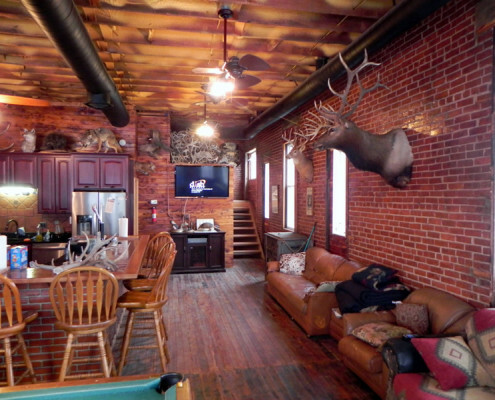 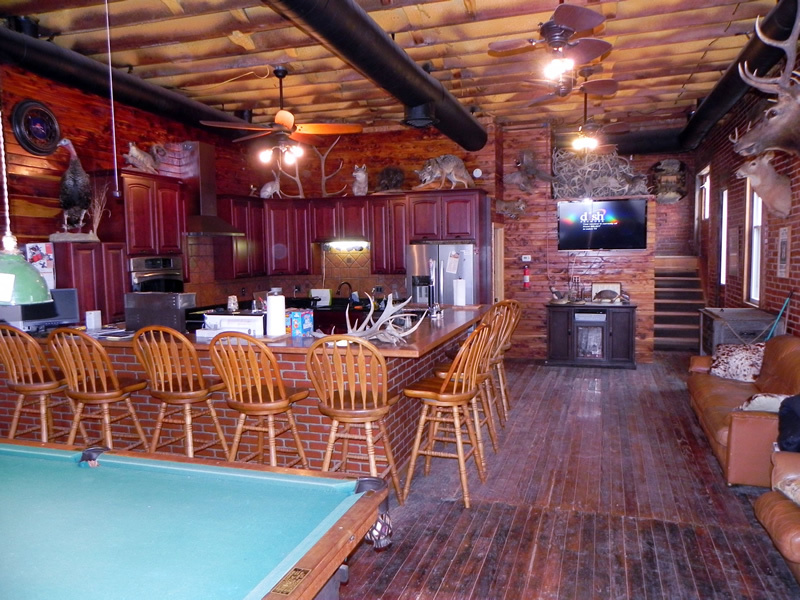 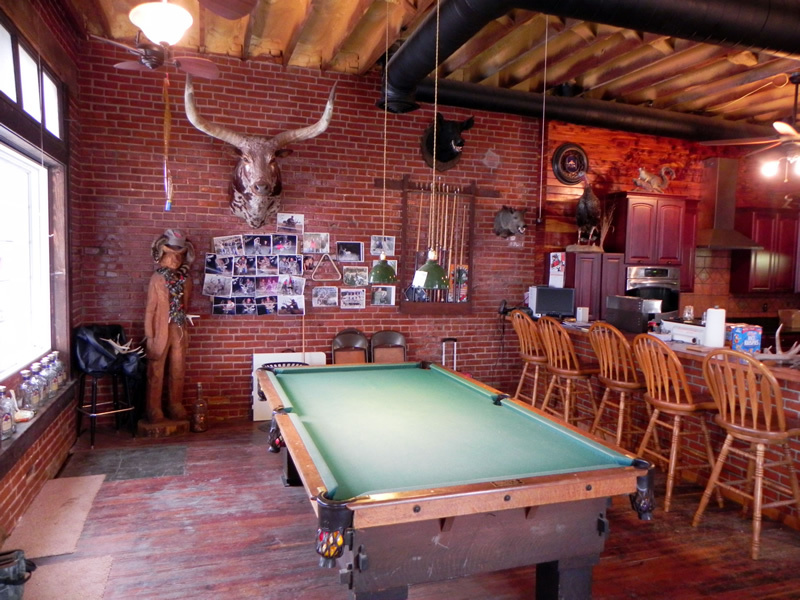 Buster’s Outfitters Hunting Lodge is a completely restored historic two story brick bank building which is just over 100 years old. 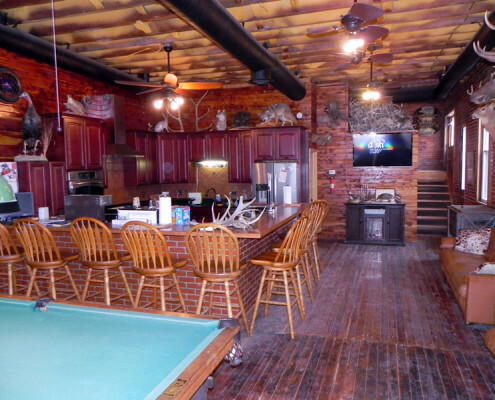 The interior has been completely refurbished for your comforts and special attention was given to be sure and keep the old charm of the building intact. 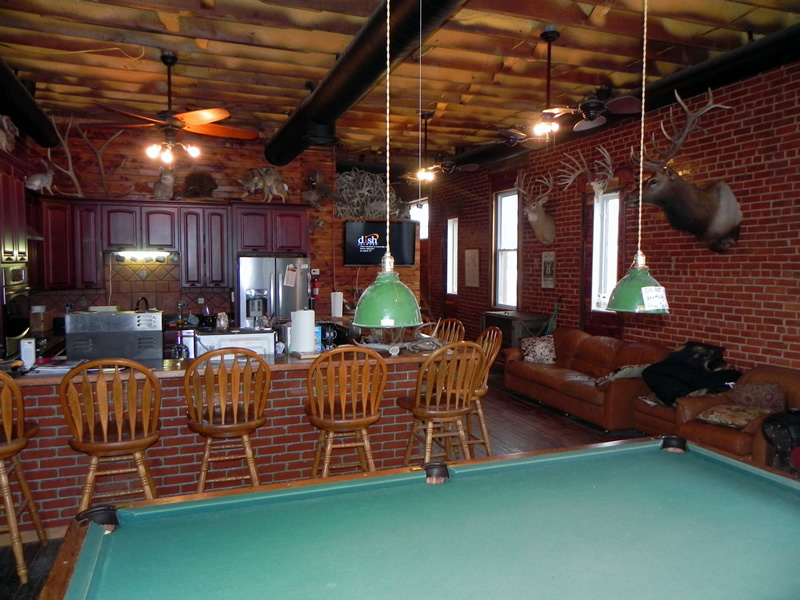 The Hunting Lodge has six private bedrooms, a new kitchen, bar, pool table, big screen TV and lots and lots of character. Looking for a great Kansas hunting experience? 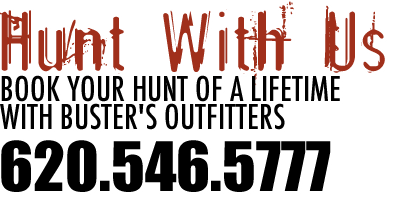 Buster's Outfitters is the place for you for everything from Whitetail Deer and Turkey to Exotic hunting, Elk and Buffalo. Call (620) 546-5777 to reserve your dates. 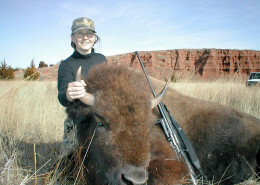 The hunting regulations information provided on these pages is a service to hunters. The information has been prepared as a guide only and is not a complete list of regulations. 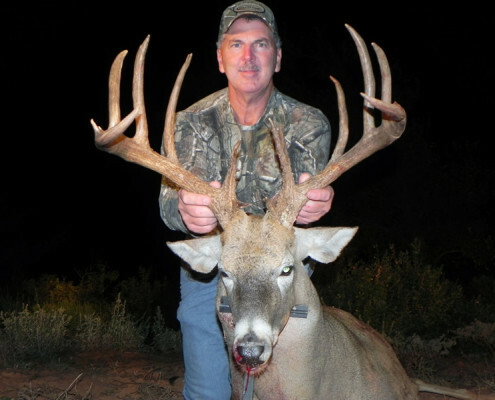 The 2015 annual hunt/fish licenses go on sale December 15, 2014. 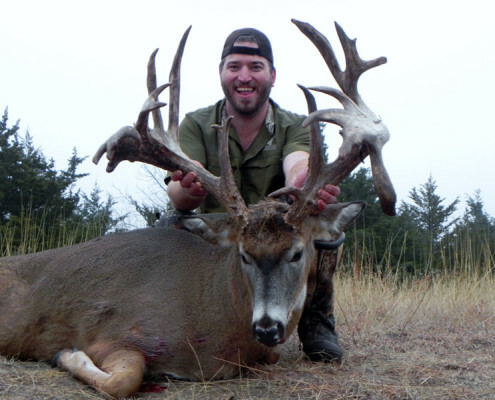 They will be valid for the remainder of 2014 and valid for the calendar year of 2015.